Ever since we enrolled my daughter J, now 8, in piano class about 2 years ago and subsequently we bought a used piano for her, she stayed with the same teacher for the most part of it. She likes Teacher Serena and nothing wrong with her. She is all great and patient. But there was one problem. J didn’t speak a word throughout the lesson. Whenever she was asked a question by the teacher, she used sign language to answer. Either by nodding her head or flipping her fingers. You might laugh but that is what happened. How can one learn piano (or anything else for that matter) without opening his mouth? My wife and I were not sure what to do. And it dragged on. To make things worse, she had showed signs of dwindling interest in piano. That got my wife worried like never before because she really wanted to see J could make it through instead of giving up piano half-way. Also we didn’t do much about it because J told us she likes the teacher. Until a month ago, my wife took the courage to make some changes in her piano routine. She went and asked about piano lessons offered by another center. We were in luck as we managed to get a time slot taught by the founder herself. We know Teacher Peggy from our previous encounter with her when we sent J to her music class many years back. The reason we switched class is we wanted to give J a new learning environment with the hope that she would be more interactive with the teacher… and hopefully her interest in piano would be re-ignited. Without hesitation, we registered for the new class. Now the only problem left was to let the existing teacher know we wanted to stop the class. We didn’t want her to feel that we stopped because of her. Another challenge was we were not sure how well J would take up this new class. In life, there are risks associated with everything we do. So no harm trying out the new class because you never know what is in store for you. Note: We didn’t insist J to continue her piano lesson. If she didn’t like it at all, we would have asked her to stop. But we didn’t. We realized that after some discussion with her, she actually does not hate piano. In fact, she loves it… when she knows to play a song. That’s why we encouraged her to continue her class. It has been a month already since J changed her class and we can see that J has found her renewed interest in piano. Previously, J needed to be reminded a few times before she actually walked to the piano and did her rounds of practice. Now she starts her practice without the need to be reminded. That is a BIG good sign. Not only that, she now talks to the teacher (one word or two). Though not as much as we want her to be, but again, it is still an encouraging sign. Later J told my wife that she now looks forward to piano practice because the notes given by this new teacher are easier and she can pick up the music in a much shorter time. 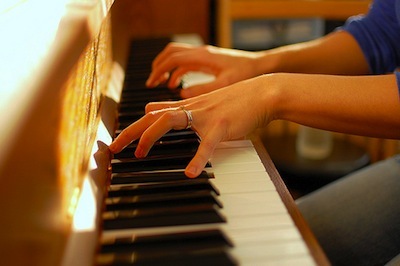 She is more motivated to play because she can hear the rhythm of the music though not perfect. We are relieved that we didn’t quit on J when she mentioned in the past that she wanted to give up on piano on a few occasions. From this experience, we learn that by giving a conducive learning environment with the right teacher (for your child) is equally important as the interest when it comes to learning. Don’t give up on your child too quickly before trying out all other means to keep him continue the journey – as long as you feel that your child has interest or talent in something. That said, I know it is not easy when to call it quits or when not to give up. You just have to talk and listen and take note to find out. If your child is not interested at all, by all means, drop it. But if it is caused by everything else but interest, help your child to keep the passion alive by making some changes… just like what we did.